The online uproar Thursday night was swift and loud following Andrea Horwath’s reported statement on Hamilton’s B-Line LRT project that City Council has the option of spending the $1-billion dollars on other local transit projects. Depending on your interpretation of her comments, she was either changing her position on LRT, providing an honest answer to a question – that being that the Province cannot impose its will upon the municipality -, or that she was changing her position on LRT in response to declining public support for the project. Horwath issued a carefully and strongly worded statement Friday morning stating “Should Ontario people elect me to serve as premier … Hamilton is getting an LRT, and there will be no more delays”. Horwath’s first role and priority is as leader of the Ontario NDP, a party which has a very good chance of forming the next government. She cannot afford to get drawn into a local issue quagmire such as Hamilton’s LRT; especially since other parts of the province have good reasons to be resentful of the Hamilton LRT deal – no other municipality is getting 100% no-strings attached funding for higher order transit. Hence, Horwath is not clarifying why she choose her wording Thursday at TheSpec. 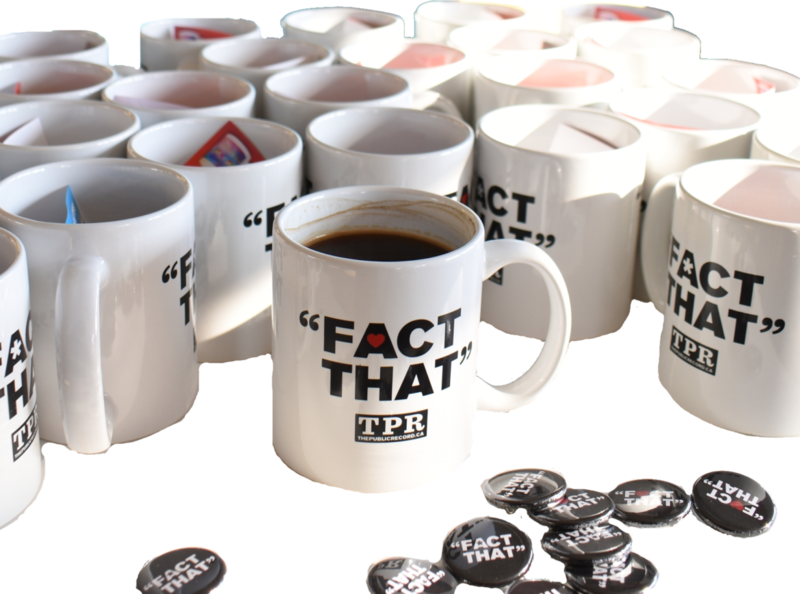 Political operatives affiliated with all three parties are telling me off-the-record that polling both for the provincial and municipal elections is showing that LRT is increasingly unpopular. I haven’t seen the polls, and I can’t confirm this information, but coming from all camps, I consider it credible. Even Mayor Fred Eisenberger, the current champion of LRT, is seeking to minimize LRT as a topic in his re-election campaign. Was Horwath’s statement on Thursday reflective of opinion polling in the riding of Hamilton Mountain? Is the NDP trying to thread the needle on the issue to avoid losing Hamilton Mountain to the Progressive Conservatives? We don’t know. The recent Metrolinx non-scientific poll of public opinion along the B-Line LRT corridor reveals a very real problem for Hamilton’s LRT project: public opinion. 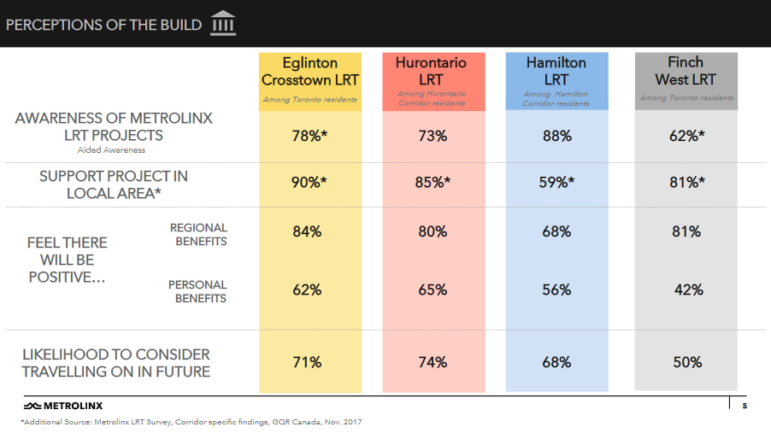 Only 59% of those surveyed in Hamilton support the LRT project, the Hamilton result contrasts with significant support found in other communities with LRT projects nearing construction or underway. This poll was conducted along the LRT corridor, where support for the LRT is believed to be highest in Hamilton. With only 59% support there, it’s reasonable to believe the LRT does not enjoy majority support elsewhere in Hamilton. How did LRT lose public support? Especially along the corridor? There’s been a noticeable shift in what I’m hearing on LRT in East Hamilton and Stoney Creek. People are telling me they’ve changed their views on LRT, with two themes being prevalent: Hamilton can’t even run buses, and the LRT means displacement. In Stoney Creek, for example, during the Transit Crisis there were occurrences of 90 minute service gaps during rush hour, with 60 minute rush hour service gaps occurring enough that effectively public transit was no longer an option. People have to get to work, and while City Hall says cancellations amounted to less than 2% of all trips in 2018, this still equals five weekdays of the bus missing each year. How many jobs allow you to be randomly late five times per year? Now that people have come to rely upon their second vehicle to get to work, they do not see themselves using the LRT, they look at the construction as being very disruptive, and see the LRT as taking away lanes from cars. The HSR Transit Crisis has diminished both the HSR’s paid ridership count, and severely undermined confidence in public transit. Hamilton’s LRT has primarily been presented as a economic development project from the beginning; but it needed a strong public transit use case to gain and maintain public support. Some East Hamiltonians who rent are trapped; if they have stable housing, they cannot move without paying hundreds of dollars more per month for a similar sized unit. Many who are renting from smaller landlords in duplexes and triplexes face the anxiety of their landlord selling, and then being forced into the rising rental market. The City has tirelessly promoted Hamilton as, among many slogans, the new Brooklyn – a place for people to move to and take advantage of lower price housing stock. The impact of these marketing campaigns on attracting new residents – with higher paying jobs based in Toronto – is impossible to measure, but long time Hamiltonians feel squeezed and point to this as a factor. 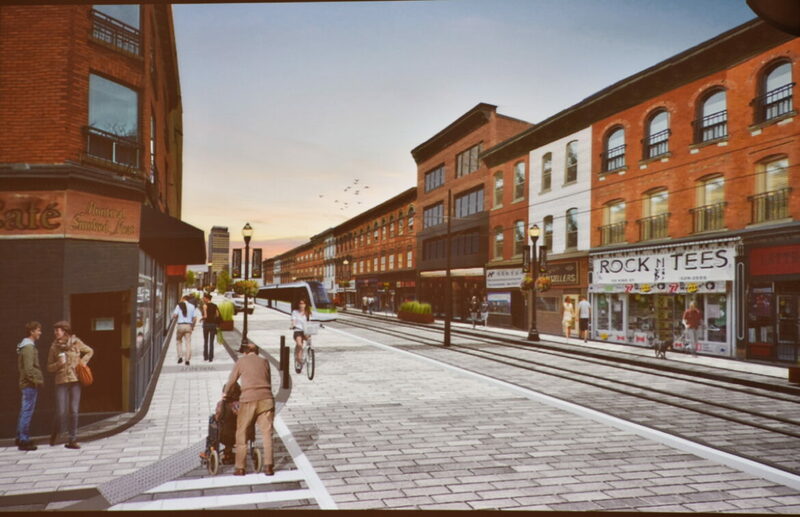 Residents of East Hamilton remember the City’s infatuation with attracting the “Creative Class”, that the LRT is primarily marketed as a economic development project, and politicians citing the planned LRT as a primary reason for new development along the LRT corridor. New build one bedroom apartments are renting for over $1,500 per month; making them unaffordable for most Hamiltonians in a city where the median total income of one-person households was $33,153 in 2015. Padmapper is reporting the average one-bedroom listing on their website last month was $1,060 per month, an increase of 14% year-over-year. Even at the median income of $33,153, average rent is above 30% of income. Over half of Hamilton’s one-person households have incomes below this median. The LRT isn’t the cause of raising rents in Hamilton, it is however a tangible political issue that people can use to express their frustration at government in response to rising rents. This Thursday, the Hamilton Tenants’ Solidarity Network and the Hamilton Legal Clinic are holding a meeting to organize people being displaced by LRT expropriation. The LRT is increasingly been seen as a problem for people living along the route; and not enough is being done to address this. I read Horwath’s comments as just the latest in a series of events that put the LRT project in doubt. It was Ward 3 Councillor Matthew Green’s motion to have the LRT run by the HSR which delayed closing of the project contract. Green moved the motion to support the local Amalgamated Transit Union’s fight to have the LRT workers unionized in their Local. Organized Labour is split on the LRT, opposition in the community is getting louder, the Ontario Liberals appear destined to loss on June 7th, the Progressive Conservatives are promising to eliminate the Hamilton LRT project if elected, the NDP is promising to implement it, but with no agreement on the state of Provincial finances, does a project with lukewarm support survive if the Provincial Treasury is bare? Right now, the LRT project financial model is design, build, finance, operate and maintain. This means the Provincial government will be paying finances charges to the private consortium which builds the LRT over a 30 year term. Organized Labour wants – at a minimum – to see this changed to have the local HSR operate. Will a NDP government ignore Organized Labour and maintain the LRT project as is? Who will lead LRT in the future? One thing thats not reported here is that Metrolinx wants to blackmail H.S.R. if they dont make full use of there oresto card or lose gas tax refund worth $3m a year to this city.THATS BLACKMAIL AND A CHRIME .HOW can city council ignore this threat?This plan from the start is a political agenda to move wynnes agency forward at any cost.Its not what it can do for the city but what can it do for METROLINX.A POLITICAL AGENDA THAT HAS NO BOARDERS. ON THE WRONG SIDE OF THE LAKE. We have a number of concerns in this area as far as pollution..Not settled by the M.O.E. Dofasco pollution.Tar Pitch incident releasing toxic fumes into air.know cancer agent.this incident has also gone quiet.Grain dust is air bourne.All these concerns must be dealt with before we get to the point of building in this area .Ignore it and it will put peoples health at risk.